I originally met Kiki Zikou and Aliki Hamosfakidis of Dolphin Hellas through my friends Stavros and Sarah who own the Hotel Stavros in Sifnos. One of our favorite things to do used to be sitting around and complain about the lack of personal service tourists get when they come to Greece. Most came with big package tour companies and were treated more like sheep than guests. We knew there were some very good agencies in Athens that provided excellent service and individualized itineraies to their customers. But the big agencies had a virtual monopoly on the tourist information people could get about Greece and most of the American travel agencies were working with a handful of these companies. It was a case of the rich getting richer and keeping the smaller agents from getting their fair share of the market. As the big companies got bigger they were unable to offer the same level of personal service that they had forged their reputations on and became more like tourist factories. 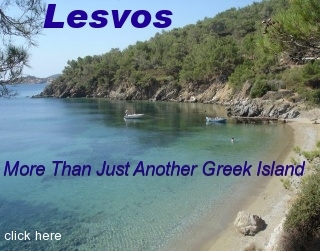 Travelers looking for a quiet island were being sent to Mykonos and Malia, Crete and going home unhappy. As one Scottish woman said to me on the bus from Agios Nikolaos to Iraklion "Besides the weather and the water what does this country have to offer?" I think I took it personally and I asked Stavros and Sarah to name me an agency that really cared about their clients and was not just in it for the money. "You have to meet Kiki Zikou at Dolphin Hellas!" they told me. I met her in Athens and that was 20 years ago. Since then I have been referring travelers to them and recieved countless e-mails praising them. Anyway as you will see if you read these there are plenty of happy customers and chances are if you decide to work with them, you will be one too. In fact there are so many of these I had to ask them to stop sending them to me. You may also get some ideas for your own holiday. I am a travel agent here in the U.S. yet I did our whole trip to Greece with Aliki/Dolphin Hellas as I am in a wheelchair and had been told by many here in the States that I would not be able to "do' Greece. Aliki accomplished the impossible! We had 2 weeks of travel that were unbelieveable. She did not know that I was an agent until we met her in Athens. What she did was marvelous. We did not have a problem in our travels. When I am booking clients from the US, I will only deal with her. Neat Person (and extremely competent also!). Matt, Hiya. I just wanted to say how helpful your site has been. We used it extensively for our recent trip to Greece. Even though we lived in Athens for nearly a year, it had been been over four years since we returned. We booked a cruise through Dolphin Hellas and they were wonderful. Aliki and Uli made us feel as if we were their only customers and took very good care of us. They made sure that we were away from discos and bars on the ship so that our two small children (and us) could get some rest. We had a very relaxing time visiting the islands. We hope to return to Greece one day soon and we'll use Dolphin Hellas and your site again. Thank you! Contact Kiki with Dolphin Hellas in Athens. She put us in the Phillipos Hotel. It had a great location next to the Plaka, air-conditioning, breakfast buffet and small but nice rooms. Depending on the season, approx. $80 per nt., double. Matt Barnett gave us great advice, and Kiki was wonderful to work with, a true professional! I am a travel agent, so I do know. info sheet posted at the Carolina Coffee Shop last year! It was full of wonderful info. time I went. I now plan to try to return every few years to explore a little more of the country each time. her travel agency seems very well run. All the folks there were on top of things. Thanks again for your helpful info. Just to let you know -- I just got back from Greece yesterday. It was my first trip abroad and you helped me soooooo much! Thanks for Dolphin Hellas. Even though I couldn't hook up with Kiki, I dealt with Aliki and she was awesome! She helped us so much. When I arrived in Athens, I walked to their office and met her. She's very gracious & professional -- it was a pleasure. I took her picture with her permission -- as long as I didn't put it on the Internet!! One question: I know you usually spend quite a bit of time in Greece when you go. How in the world do you deal with coming back to the States??? I think I'll have to take Prozac just to deal with the depression of not being there anymore!! I hope the salmon was OK. Just a small token of my appreciation. Hi, Matt: Wanted to tell you John and I had a wonderful trip to Greece a couple of weeks ago; we used a lot of the information you sent us, and it was very helpful. Thanks for sharing with us. We made all of our arrangements through Aliki of Dolphin-Hellas Travel Agency, and everything was handled so well. We stopped in to thank Aliki, in fact, and she said you come in quite often. What a lovely city Athens is, and we also so enjoyed the Islands and the stop in Turkey (Kusadasi) where we toured Ephesus. We will certainly recommend your help and the travel agency to whoever asks. Peloponnese on our own and driving 1334 km. All arrangements, reservations by you were outstanding; we had no problems or difficulties. We would change nothing and will recommend you highly! Just returned from Greece a few weeks ago. Thanks so much for your web site and all the information. It truly allowed my dream to become reality. Uli at Dolphin-Hells was fantastic! I was there during the Mariner's Union Strike, and got stuck in Athens for 4 days. Enjoyed it though, and Uli worked hard to make changes to my itinerary and everything turned out great. I would have been LOST had I used a U.S. travel agent. perfectly and we had a brilliant time. Jim and I would like to extend to your our sincere Thanks for all of your help in preparing our vacation in Greece. You put together our trip on a very short notice and everything was perfect. All of the accommodations were excellent...the view of the Parthenon from room 601 at the Acropolis Select was well worth the extra fee, the breakfast buffet was fantastic and the staff, very friendly. The Knossos Palace was a complete surprise as we thought it was going to be a tiny ferry, it was impressive. The Irini in Herakliion was comfortable and friendly, the only negative being the parking and getting around all of those side streets. The Kriti Hotel in Hania was a most perfect location and also a very friendly staff. Your suggestion for 2 nights in Hania was a good one. The tours to Delphi and Mycenae/Argolis were quite enjoyable. Thank you also for you help and suggestions concerning my luggage. It did arrive at the Acropolis Select on 26/12 a few hours after we had left for Crete...but that was okay...at least we knew it wasn�t lost forever. I took you suggestion and called Olympic Airlines more than a few times a day. I also was able to get $100.00 from Olympic Air without any receipts....thanks so much for telling us about the money as Olympic didn�t exactly mention it!!! Thank you again so very much!!!! .... We�ll be back....Greece is a beautiful country. I have also sent this e-mail to Matt Barrett. problems encountered by us (my daughter and I) during our entire trip. We only found Greece as we left it, full of love and beauty. Hope you and your family had/have a wonderful holiday too. favorite. We definitely will want to go back there and spend alot more time. drive (and what a drive that is!). departure. Your timing was perfect. only one call to Uli. So that worked out very well! e-mail out as a reference if you need to. ferry on Tuesday night! Oh well. wanted to tell you we had a wonderful time in Greece. was magical and we are coming back someday! I had a wonderful time! Thanks for all your help. people warm, kind and generous. It is a trip both me and my sister will never forget. All the best to you always. > changes along the way, and both were invaluable. > quickly we can get back again! great, The People Friendly, and the Weather Perfect. Just wanted to say thank you for all your assistance with my trip to Greece. again. Thank you for helping to make it all possible. and to give you a little feedback on our experiences. worthwhile, and thoroughly enjoyable experiences. thanks for your assistance in planning our trip. have recommended you to many people. Til next trip. Greece and will definitely call upon you again. I will certainly recommend you to anyone else going to Greece. to anyone who plans to visit Greece. any kind. Your country is so beautiful and the people were kind and helpful. are very gratefull to you. May be some friends we write to you and mentioned my name. We hope to contact you soon. WE ENJOYED YOUR SELECTION OF HOTELS. THANK YOU . Uli, Our trip was great. Thanks for all your assistance. references if any of your potential clients should want to contact us. for Greece, we shall give them your name. Paros. We had a wonderful time, the Hotel was great. location within the hotels. Our trip was fantastic! in Greece. The trip was fantastic! Everything went very smoothly and our accommodations were excellent. family travelling to Greece for honeymoon or vacation. with you, which I have attached. make it very special for both of us. pictures soon. All of our pictures turned out great! miserable plus everyone got drenched from the sea water while waiting! very nice also and we found all our American restaurants in Glyfada! Except for the two days of high winds, our weather was great. sure that will be exciting for you. We hope you have a happy holiday and wish our best to Youli. our driver, was excellent--and also just a pleasant person to be with. And thank you for your patience with my bungling. professional and I would like to thank you for your recommendation. Kiki Zikon came into the business only when we came down to payment. patience to arrange our travelling. We really appreciated her business. We have just returned this weekend and had a wonderful time. country! We actually made it down to Mystras, which we loved. Athens, an easy walk to the historical sites was essential. strike was over--next time, we would take an overnight ferry. Our trip would not have been nearly as successful without your valuable help. arrangements. We look forward to another trip, sometime in the future! every year in the future. you for all of your help. much. We all want to thank you for your help. it. The hotel in Athens was perfect for this trip. will be a next time) I shall ask for your advice. beautiful as it realy was. Thanks loads for you expert, fast, and efficient help. sites during the day)! Our home in Santorini was absolutely perfect! making our 25th wedding anniversary PERFECT! and we look forward to visiting it again. us off the wait list, and find us in Athens to get us the new airtickets. York travel agent. We were doubly glad we used you! by you were outstanding; we had no problems or difficulties. people stop their cars and dump their garbage on the side of the road. week rather than four days. disappointed in them or the meals. lasted an hour and gave us a reason to spend more time in the museum. on the things we wanted to see. Athens since Elaine had a sore foot and wasn't up to a lot of walking. with home via the Internet, They were knowledgeable, helpful and inexpensive. home before things got too bad. She'll be fine and home in a couple more days. Christ's birth and New Year 2000.
went looking for the Byzantyne (?) gold shop. They were all closed up. of closed and locked up places. and the Plaka area - was ideal for our first night in Athens. recommend you to friends who we are encouraging to make this wonderful trip. Thank you very much. We can't wait to be back in your beautiful country! honeymoon. We had a wonderful time. I think we went at the right time. for the whole trip. It was beautiful. Alot of stair climbing though. home was long and uneventful. beautifully and everything went like clockwork. It was wonderful!!!!! our recent trip to Greece. Everywhere we stayed, we were warmly welcomed. very hard for us to leave. you cannot speak face to face. you in person while in Athens. to know the beauty of your country. wonderful time in Athens and Santorini. Thank you for all your help! recommend it to anyone travelling to Greece. net at first, but you made the experience a truly positive one. Thank you! hotels, car arrangements, and the ferry arrangments worked perfectly. anyone I know who is traveling to Greece. You made our trip much easier. Thanks for your help. I would recommed your services to anyone. reservations while on my trip to Greece. Thanks for all your help! be sure to keep you in mind when booking my arrangements while there. friends who may be heading your way. adorn my office walls as reminders of my pleasant time spent there. have the best view of the sunset. he ever had, then Takkis sat and talked with us until we were ready to leave. the second day, we went to Mycenae and Epidarius, quite interesting as well. The rest of our trip was in Italy and France. again, but we did enjoy it. hotel in Paros to check on us. see the Parthenon from our room at the ... Hotel in Athens was a real treat. Through motor scooter or car we were able to see most of Paros and Santorini. most stunning vista that I have ever seen. People were helpful and friendly. experience it for a couple of weeks. our trip. It was great to have a travel agent that really cared. 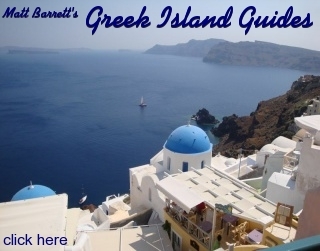 recommended, and we will certainly book our next trip to Greece through you. law student from Boston who visited Greece for the whole summer. trip to Greece so special. before I left. By the way, everything at Hotel Attalos wa fine. It was reasonably priced and convenient to Plaka which was great. you. I do not think others will give me such good service. We just returned from Paris after a lovely holiday. here yourself, please do email us. accomodation for my relatives and friends during the last week-end. I will pop over tro Athens next time, ok ? visiting again. Thank you very much for all your help. the flights from Athens had been delayed. go there by public bus ( as a personal challenge ). found our way to the gates. He was even awake at 3:29 AM !!!! Candia Maris : This was almost empty but a truly first class experience. future as it is a wonderful country. recommendation and hopefully they will contact you soon. working with you in the future. too, well about 55 degree Farenheit but that is cold for Houston. Thanks again for helping to make a great honeymoon for us. end of our dinner so that she can get the mini-bus to come get us again. to Santorini to call up Luisa from Bellonias Travel 6932409406. First, I read over your newsletter and recommendations for visiting the islands. I made out a tentative itinerary and contacted Dolphin Hellas. I received a response immediately from Uli Perschau. What a professional. She worked with me, made recommendations, changes when I changed my mind, and had everything organized perfectly. Having all the vouchers for hotels, tickets for ferries and airlines made the whole trip go so smoothly. No waiting in line or trying to find the ticket counter.